SofTutor for Photoshop Elements 2.0 contains over 3 hrs of video instruction covering over 50 topics with example files. You`ll master Photoshop Elements in less than 8 hours! 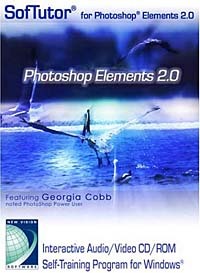 Power User Georgia Cobb, teaches you Photoshop Elements from beginning to intermediate. How to edit pictures, work with layers, tools and more. Over four hours of hands on video instruction. Georgia will make you a power user in no time. Minimum system requirements: Multimedia PC 486/33 or higher, Windows 95 or better (98, ME, XP, NT 3.51, 4.0 or 2000) 16+ MB RAM, 2x CD/ROM Drive, mouse, 6 MB disk space (minimum installation) 20 MB full installation, VGA adapter with 256 colors or better. Soundboard is not required but highly recommended. Minimum system for follow along learning, minimum requirement for your Photoshop Elements version, 17" monitor or higher, video board with 4MB RAM or higher, resolution of 1024x768 (XVGA) or higher. We recommend that you use this with Photoshop Elements to maximize your learning, although Photoshop Elements is not required. Купить в магазине Озон:OZON.ru - 2977 00 руб.